Systems adminstrators can develop retention schedules at the archive, date, key cross reference and individual report level. Retention periods can be defined either by lapsed time or by assigned date. Assigning an expiration date is easy with the point-and-click schedule provided. 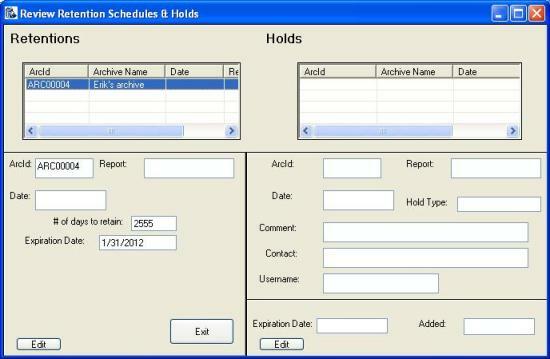 System administrators can also assign ‘holds’ for reports, dates and entire archives. ‘Holds’ can be indefinite or until a certain date is reached. Comments and contact information can also be assigned along with the ‘hold’ on any of your LVreports for analysis purposes. Editing a ‘hold’ or a ‘retention’ is as easy as clicking on the listed item. All report information can be exported to Excel with the click of a button. Purges can be set to run daily or monthly. Reports can be set to purge anywhere from the next day to several years later. The auto-purge will clean up any attachments associated with the expired document and will automatically update all of the global indexes and key cross references. A pre-purge report can also be generated for review before committing to deletion.